It's no secret that just like the rest of the world, we're obsessed with CHAI. Last month, they were the most talked about group at SXSW and it's no surprise why — these talented gals from Nagoya, Japan bring so much energy and passion to their live performances and it's a joy to witness live. With the help of a translator, we had the opportunity to ask them about their time in Austin, travelling and their new album PUNK. What was your favourite moment of SXSW 2019? Mana: The NYLON x She Shreds showcase that we did at 1AM! It was the first time I got to see people coming into the venue one after the other. The stage was outside and facing 6th street and as we continued to perform, more and more people heard us while walking past and kept filling in the venue! I was so happy! I could literally feel it in my bones! Kana: I feel the same as MANA. At every stage we performed at this year, we literally saw and felt the difference in the crowd. It was that feeling of, “wow, people are really here for CHAI” and “CHAI is in the building!” all at the same time. Last year was great but this year was even more GREAT! Yuna: We got to perform at bigger stages this year so that of course was amazing! But we also got to reunite with one of the stages we performed at last year which was Burgermania with our Burger Records family. We got to see people we love like Sean and Lee who run Burger Records and even make new friends! This year’s SXSW was really amazing. Yuuki: Just as YUNA said, we got to perform at bigger stages but also once we got off the stage, we had so many people approach us! Fans, media personnel, and even other Artists as well! At this year’s SXSW, we really felt like people were relying on us, looking forward to us performing, and came just for CHAI! Where would you like to travel to this year? Yuna: Would love to go visit Bolivia and see the Salar de Uyuni! It’s the world’s largest salt flat and is known for it’s mirror-like appearance due to the sky’s reflection. Kana: I want to go visit the pyramids in Egypt! I want to go inside! Mana: I want to go to Machu Picchu in Peru! Also, Hawaii! Kana: Even Thailand and South Korea! We’ve been to Seoul once for work last year but we’d love to explore more! The food is amazing. Yuuki: We went last year for work and this year we have our first UK and EU tour but would love to explore as a tourist! Eat lots of food and get to know the different cultures more. How is your new album PUNK different from Pink? Yuuki: I’d say the biggest difference is where we were, as a band, at the moment we created both albums. When we were in the process of making PINK, we incorporated everything that we were feeling at that moment as goes the same for when we were creating PUNK. With PUNK, we had experienced more, especially overseas. We got to perform in different countries which in a sense, shows a more “grown” CHAI than that of the PINK days. 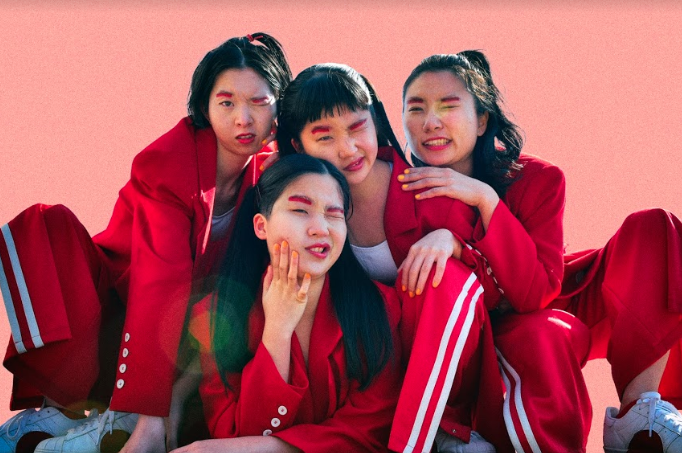 Kana: We can’t and won’t make the same type of material that we made at both the times of PINK and PUNK because just as people evolve over time, so does CHAI. We want people to hear and feel what CHAI is feeling at that given moment. It’s similar to how people mature in life. Your friends change, the type of foods you like alter, your interests change, and that’s exactly how we feel about our songs. As CHAI continues to grow, the music grows! Mana: The meaning behind the album PUNK, is not the genre, but the mindset of punk. To be free, live your truth, and do as you please! Becoming the person you’ve always wanted to be. Our goal this year is to live by this mindset! What inspired you when creating the album? Mana: Artist inspirations were The Go! Team, N.E.R.D, JUSTICE, Taylor Swift, Arrested Development, and more! As we mentioned earlier, how we felt as a band at that moment when we were creating the album was the biggest inspiration. We had toured as the opening act for Superorganism last year as well as travelled the US for our own tour, so given those experiences, we had a lot of different emotions and thoughts to include in the PUNK album. Yuuki: As far as the lyrics goes, I based them on any insecurities we were feeling at the time we were making the album as well as things we were all nervous about, interested in, and haven’t done before. Just like PINK, PUNK is based on what we experience in our lives. Of course, we always mention food though! With PINK, a lot of the lyrics were based on insecurities we wanted to get out! With PUNK, although our topics haven’t changed much, our confidence has grown and it expresses the CHAI, AFTER getting all of those insecurities out and accepting them! Who comes up with the ideas for your music videos? Mana: We come up with the ideas for the music videos and we discuss them with the music video director on how to convey them. We usually have SO many things we want to do in one video so having an outside source like a director or stylist assist in compacting those ideas is super helpful. If you came to Australia what would be the first thing you would like to do? Kana: As soon as I land, I want to run and hug a koala bear! Yuna: Would love to visit the Great Barrier Reef! The largest coral reef! I want to scuba dive! I love water! Anything with water is where I want to be. Mana: I would love to go sight-seeing and hold a koala too! I want to hang out with all the animals. Yuuki: I would love to just run through the grasslands like Little House on the Prairie! Mana: We have our upcoming UK and EU tour in May! Super exciting since we won’t be opening acts this time but going on our own actual tour! We even get to hit the stage at festivals like Primavera, This is Not A Love Song, and more! Yuuki: Living our lives as PUNK! Not the genre, but living the way we want to, how we want to, and becoming the person we want to be.